Exploring Brussels in sight and sound . . . 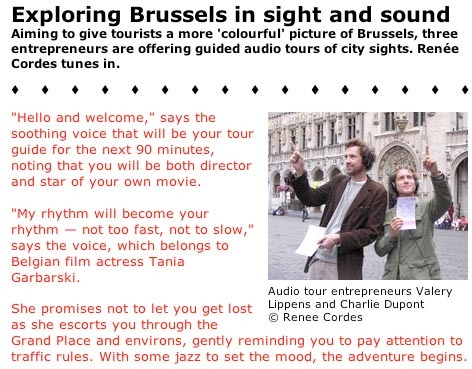 Exploring Brussels in sight and sound Aiming to give tourists a more ‘colourful’ picture of Brussels, three entrepreneurs are offering guided audio tours of city sights. Renée Cordes tunes in. “Hello and welcome,” says the soothing voice that will be your tour guide for the next 90 minutes, noting that you will be both director and star of your own movie. “My rhythm will become your rhythm — not too fast, not to slow,” says the voice, which belongs to Belgian film actress Tania Garbarski. She promises not to let you get lost as she escorts you through the Grand Place and environs, gently reminding you to pay attention to traffic rules. With some jazz to set the mood, the adventure begins. During the walk, you learn why ‘spending a night at the Amigo’ can mean either bunking in jail or at a fine hotel, approach the St Michel and St Gudule Cathedral from the best possible angle and hear the start of a show at the Toone marionnette theatre. The self-guided audio tour is the third and latest release — now available in English in addition to French and Flemish — from D*Tours, a Brussels-based company launched in early 2003 by Valery Lippens, Charlie Dupont and Michel de Launoit. The trio started with the Marolles district in March 2004, followed by the St Catherine area in Brussels last October. “We don’t want to give a history lesson,” insists Dupont, Garbarski’s husband and an actor himself who creates the concept and script with Lippens and narrates the Marolles tour in English. “We want people to be able to choose what to remember.” Lippens, a lifelong music-audio enthusiast, calls it a “sensation exhibition”. Friends since they were teenagers, Dupont and Lippens — now in their early 30s — were inspired to launch their business after Lippens took a self-guided audio tour, one of the world’s first, at San Francisco’s Alcatraz Island. Launoit — who had previously teamed up with Dupont in several entertainment ventures — was brought on board to oversee the business side. At first they thought of naming the company Walkumentary, but thought the pun would be impossible to Frenchify; hence the name D*Tours. Then for the real work — deciding the route for each tour, collecting the raw material and, finally, putting it together into one package. All of it was a two-month process. “The hardest part is to be sure that no one gets lost,” Lippens says. During production, they test each tour on willing subjects, making modifications if necessary. The impressive St Michel and St Gudule Cathedral The narrator tells the listener when to walk straight ahead, when to turn and when to stop, so everything must be paced just right. A team of students are dispatched with microphones and tape recorders to collect as many street sounds as possible — a cat meowing, beer glasses clanking, tourists gawking at Manneken Pis. They also do hours of interviews with locals and celebrities such as Belgian jazz legend Toots Thielemans. In their Ixelles district studio, Lippens mixes the audio with music and narration. He also takes the photos for the CD covers. The tours are available on MP3 players that can be rented from the tourist office in the town hall on the Grand Place and other locations for EUR 7 each, about the same as a cinema ticket. CDs go for EUR 20. Fiction or reality? A drawback of the audio tour is that listeners may find it hard to distinguish the recorded sounds from what’s really going on — imagine hearing lots of chatter and other noises when walking through an empty street. “That’s the magic. You don’t know anymore what’s fiction or what’s reality,” Dupont says. He also notes that the experience can vary with the time of day. Business tends to be better in good weather, so they were pleasantly pleased that some 100 people took the Grand Place tour in June, half of which was rainy. Afterwards, listeners can post their comments on the website: www.d-tours.org. a lot of MP3s,” Lippens jokes.